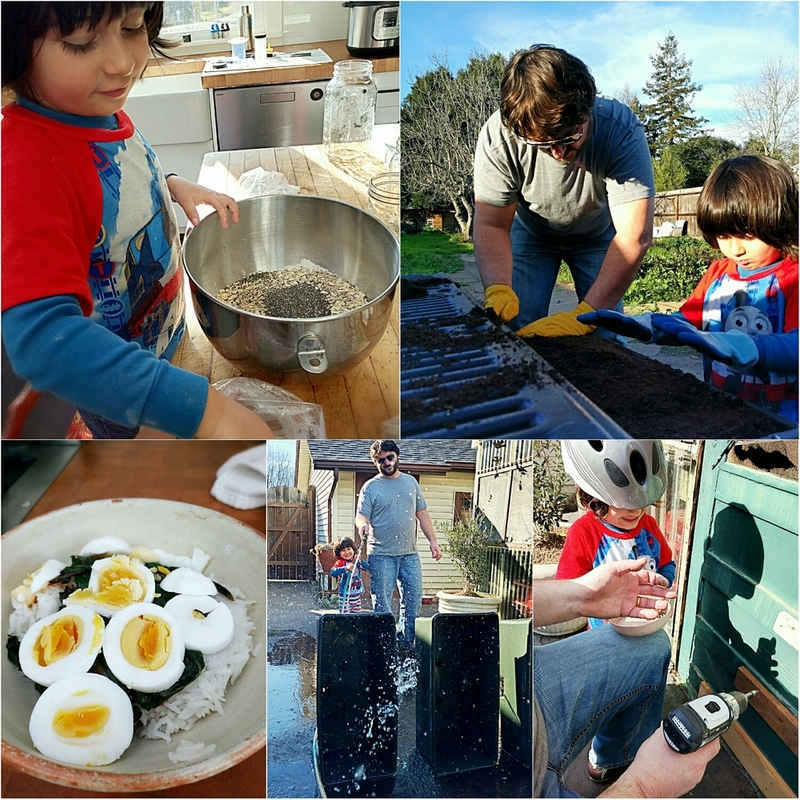 This morning I got up early with Adam and Kamal, and Kamal helped me mix bread dough and then clean the chicken waterer; later, he helped Adam fix the greenhouse door and helped the both of us shovel a truckload of compost from the pickup bed into Earth Boxes. (Most of this he did while wearing pajamas, work boots, and a bicycle helmet.) Just getting back in the garden after years of neglecting all but small patches of it while flailingly navigating new parenthood--oh, it felt so good. And getting into it with Kamal, who was right there with us, excited and dirty, was bliss. This is one of the reasons I do what I do--because of days like today, where there are so many quiet pleasures, the kind that are easy to miss if you're not feeling well, or stressed about the past or the future, or even just distracted by the noise of products advertised to you. Because I don't want to miss the quiet pleasures, or the loud ones, either. Because I want to be present in and receptive to as many moments as I can. Because I want to be your ally in helping you be present in your moments, too. Because this life is our greatest, and our only, treasure.